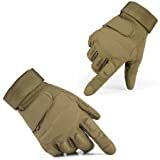 Generally, there is no big deal getting a pair of gloves for personal use, because what you are mostly concerned about is the style, thickness and purpose of buying it. It’s as simple as dropping by any store around and go for whatever is appealing to you. This is not the case when buying a pair of gloves for hunting purpose. 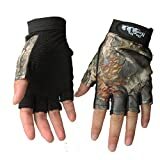 Although there are different types of gloves suitable for a particular style of hunting, waterproof hunting gloves still remain the most preferred for outdoor activities. Since you will be in an open field for a period of time and may be faced with harsh weather conditions, getting waterproof hunting clothing will be the best choice. Now that we have talked about the importance of waterproof gears for hunting, the next challenge is getting the best ones as there are numerous brands available. To make the buying process easier and less daunting for you, we have put together a comprehensive review of the best hunting gloves to buy in 2017 – 2018. Glacier Alaska Waterproof Gloves are one of the best waterproof hunting gloves for outdoor lovers in 2018. It is made of high quality material that is able to withstand harsh weather. It comes with 60g of thinsulate to keep the hands warm. It is made of genuine leather palm for firm grip while on the field and the outer material has waterproof and breathable features. Glacier Waterproof Glove is suitable for fishing, climbing, hunting, and other related activities. This is one of the best hunting gloves available for grabs. It is made of 100 percent polyester, lined with 40g of 3M Thinsulate and suitable for cold weather hunts. The palm patch enables for firm grip and its waterproof lining makes it perfect for outdoor events. It is durable, comfortable to wear and fits perfectly for different occasions. It comes in various sizes which makes it suitable for virtually every hand size. If you are looking for a pair of good hunting gloves that will serve you better, Primos Stretch-Fit will be great for you. Primos is a brand that has been in existence for some decades and it’s trusted by most individuals. These gloves are made of top notch polyester material that is durable and strong enough to withstand harsh weather conditions. It has a sophisticated design that makes it suitable for any kind of outdoor activities. It comes in only one size that is expected to fit every size of hand. Primos gloves are lightweight and breathable with a 5-inch extended cuff. 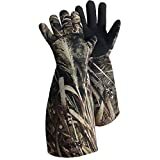 These gloves are best used in early bow or spring turkey season. 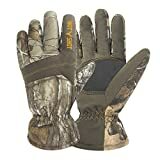 This is one of the best duck hunting gloves from Glacier. The Elbow Length Camo Decoy Glove has amazing qualities that makes it one of the best in the market. It is the perfect glove to use for setting and retrieving decoy in cold water. Its waterproof feature makes it warm and comfortable to use in cold weathers and its elbow length offer extra protection to your hands. It comes with a 2mm neoprene which helps to keep your hands & forearms warm and dry. Apart from hunting, there are other outdoor activities you can use this glove for which makes it versatile. 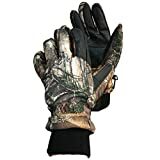 Golovejoy hunting gloves are a must on our list of the best hunting gloves. These gloves are designed for high performance and aesthetics. The packaging of these gloves will first thrill you even before using it – a vacuum packaging is used for convenience of transportation. It comes in a single size (5.2” palm wide & 4.4” middle finger) that is expected to fit most hands (but not compatible with small hands). This glove is made of high grade elastic mesh knit waterproof material that makes it more comfortable to use. The adjustable wrist strap helps for easy wear or taking off, and it doesn’t slip when using. Its other features include good breathability, flexible finger design, skid resistance and good abrasion resistance. Isafish fishing gloves are one of the best waterproof gloves for outdoor activities such as fishing, hunting, etc. It is made from soft fabric for breathability and comfortable wearing. This glove is not muggy, thus good for harsh weather conditions. The material used for the palm is tough, not slippery, abrasion resistant, fast to dry and design for easy cleaning. It comes with an adjustable Velcro strap for stability during use and convenience to wear or take off. Its fingerless design makes it more flexible to use without affecting hand movements. It is suitable for both males and females and has a high touch sensitivity. This is another great waterproof fishing glove that made our list of best hunting gloves. The LIAMTU Anti-slip Fishing Gloves are designed to give maximum protection to the hands while fishing. The palm area is made with rubber to ensure firm grip while holding fish. It also protects your hands from hooks, spines, fillet knives, teeth and gill plate. Its elastic property makes it suitable for virtually all sizes of hands. It has an adjustable Velcro strap for stability and convenience. Aside fishing, this glove can be used for other outdoor events such as camping, climbing, planting, biking, etc. Entrance Waterproof Tactical Gloves are one of the best warm hunting gloves and most versatile you can get in the marketplace. It is ideal for driving, cycling, hunting, batting, military, climbing, and lots more. The palm is reinforced to protect against abrasion and impact. Its breathable, fast drying and lightweight properties makes it comfortable to use. 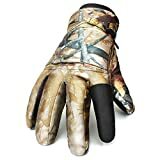 N’Ice Caps Waterproof Gloves are one of the best hunting gloves for cold weather. It is made of high grade material that makes it strong and durable. It comes with a waterproof lining and 3M Thinsulate insulation which makes it great for cold weathers and staying dry in snowy or wet conditions. It has a full PU gripper on palms, thumbs and fingers, and Nubuck reinforced thumbs for better grip. These gloves are suitable for different outdoor activities such as fishing, camping, climbing, etc. Its elasticity property makes it compatible with different sizes of hands. It comes in various camo colors which gives you the opportunity to choose your favorite. N’Icer Waterproof Gloves are tested and approved by CPSIA standards. 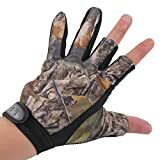 Getting the best hunting gloves for outdoor activities in 2018 not only protect your hands from injury, it also keeps them warm and comfortable in cold weather or snowy conditions. Our hunting gloves reviews will be of great help to you when buying a pair of hunting gloves.